The serifs are easily visible in Legacy® Serif (left), as compared with Legacy Sans (right), which is unadorned. Although serifs are considered to be decorative, their appearance may well serve a higher purpose. Serif typefaces have historically been credited with increasing both the readability and reading speed of long passages of text because they help the eye travel across a line, especially if lines are long or have relatively open word spacing (as with some justified type). Others dispute this viewpoint, asserting that what we read most (serif text), we read best. This might very well account for the popularity and dominance of serif typefaces in the U.S. for lengthy text in print, including books and newspapers. That said, the fact remains that many sans serif typefaces exist that are more legible at any size than some serif designs. So whichever style you choose, take note of the particular characteristics and overall legibility of the design, including specific weights and roman vs. italic. 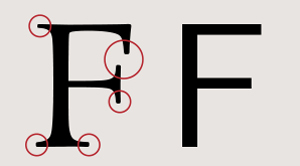 Not every serif typeface is more readable than a sans serif, as demonstrated by the fairly ornate ITC Kallos™ (left) compared with Avenir® Next (right). For projects involving lengthy text, such as books, newspapers, and most magazines, serif typefaces are the most commonly used typestyle. Their prevalence stems from a combination of historical precedent and perceived readability. On the other hand, sans serif text typefaces can be used for annual reports and brochures. Sans serifs can also work well for magazines and other materials that allow for a more liberal design approach. For other shorter text settings – such as captions, credits, column headings, as well as text in charts and graphs – a sans serif typeface can be a good choice. Its simplified letterforms are unencumbered by serifs, which can impede the readability of characters at very small sizes. Although Adobe Caslon™ (left) is frequently used to typeset books, a contemporary sans such as Metro® Nova (right) might be an appropriate choice for an annual report or a brochure whose content and look allow for a break from tradition. When selecting a typeface for young children, or anyone just learning to read, sans serifs are preferable, as their simplified letterforms are easier to recognize. This can also be relevant when designing for readers with certain visual impairments. Be sure to do your audience research before making any decisions. For an audience of young children just learning to read, a friendly sans serif such as Maiandra GD is appealing. Serif strokes can be thin or thick, subtle or robust. Delicate serifs can be challenging to reproduce crisply in certain scenarios, notably: reversing them out of a dark color, photograph, or pattern (as they will tend to break up); or printing them in CMYK (as the edges will look fuzzy or weak). Printing them in a solid, spot color is less risky. If need be, select a serif typeface with sturdy features, or opt for a sans serif. When reversing text out of black or a color, be wary of typefaces with high contrast and thin serifs (left, set in Didot), as they run the risk of breaking up when printed. Instead, select a type design with sturdy serifs (right, set in Chaparral™) that will hold up to the demands of printing reverse type.